In a recent article in The Washington Post, EFree Director Russell Hemley weighs in on the extraordinary properties of diamond that make it so important in new scientific and technological applications. “Forget the ring: Lab-grown diamond’s are a scientist’s best friend,” published on the front page of the Post’s February 14th issue, focuses on the process developed at Carnegie and licensed to WD Lab Grown Diamonds. 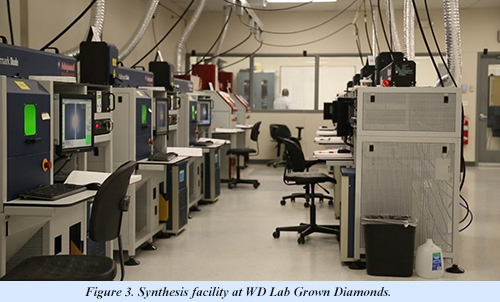 This method utilizes chemical vapor deposition (CVD) to grow single crystals of diamond in the laboratory (Figs. 1 and 2). Compared to the tens of millions of years that it takes to create diamond in the Earth’s mantle, the relatively rapid growth of high-quality diamond in the laboratory by CVD techniques now allows the synthesis of large crystals for altogether new classes of scientific and technological applications. This diamond growth process was perfected in Hemley’s group at Carnegie and later supported by CDAC, and results in single crystals that can be much larger than those produced in nature or by other synthetic methods. In addition, the laboratory growth method allows the physical properties of the material to be tailored to fit specific types of applications. While diamond continues to be of immense interest for its qualities as a gem, the need for high-performance materials in both scientific and technological applications will continue to require the type of diamond material now possible only with CVD growth. This single-crystal CVD diamond is thus superior in performance as well as size in comparison to both natural diamond and synthetic diamond produced by conventional high-pressure/high-temperature methods. 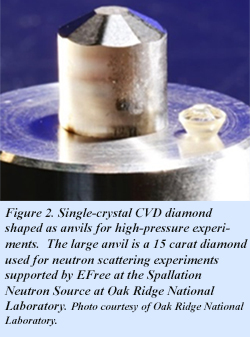 EFree and WD Lab Grown Diamonds continue to collaborate in the development of large diamond anvils for new classes of high pressure neutron scattering experiments at the Spallation Neutron Source at Oak Ridge National Laboratory. The entire article may be found using the following link.